Cost is $32.75 to $58 per booking plus applicable taxes for 2019. 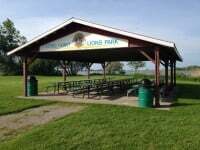 Picnic Pavilions are open May 1 to October 31. *As of January 1, 2015 these are all smoke free buildings.